1Melt white chocolate in a double boiler, spread evenly over the bottoms of the cookies. Break up the milk chocolate bar into 10 pieces, and place 1 piece onto the white chocolate side of 10 cookies. Place the marshmallows on top of the milk chocolate. 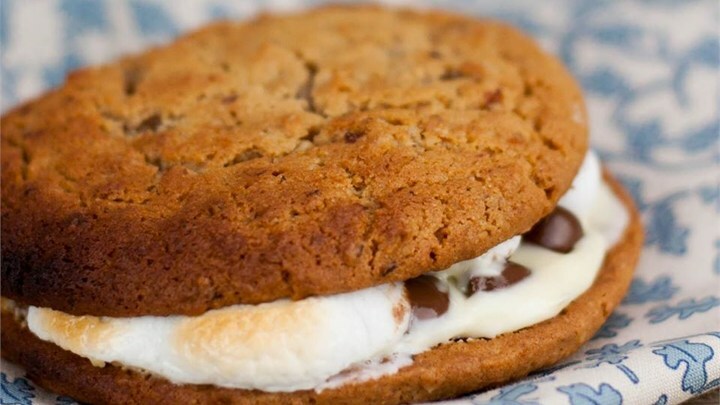 Top with the remaining cookies, creating a chocolate-marshmallow sandwich. 2Toast cookies over a campfire, or stove using tongs until the chocolate and marshmallow has melted, about 3 minutes.